This is College Physics Answers with Shaun Dychko. Gamma rays have the shortest wavelength followed by X-rays and then ultraviolet and notice that both of these are types of light that we are familiar with as being harmful. Ultraviolet give sunburns and X-rays, well you don't want to get exposed to too much. And so these are high energy parts of the spectrum and that's why the harmful gamma rays also are harmful but we're not exposed to them very much. And then energy of electromagnetic wave is a function of its frequency. So it's equal to Planck's constant times frequency, so energy of a photon. 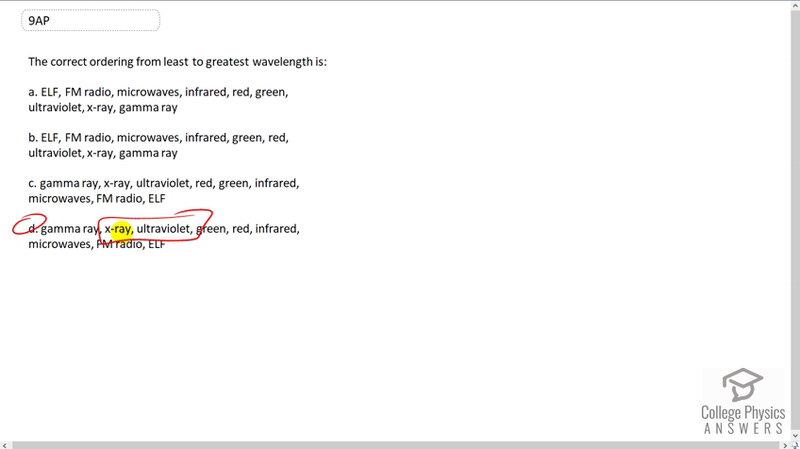 And frequency is you know related to wavelength because we have the wave equation. The speed of light is frequency times lambda and we can replace f with c over lambda. And we see that the energy is inversely proportional to the wavelength meaning that short wavelengths give high energies and so we kind of have some intuition that these must be high energy waves due to the fact that they're harmful to our bodies and that corresponds therefore to a short wavelength. And then there's green and then red and then infrared and microwaves and then radio waves and then extra low frequency waves.